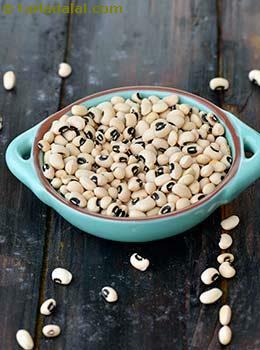 Also known as chawli beans, Black-eyed beans are creamy white in color and have a black mark on their inner curve. The skin of black-eyed beans is quite thick. It has a subtle, nutty aroma and a rich creamy taste that is slightly earthy. Chawli beans have good levels of iron helping in RBC formation, thus prevents anemia. Being rich in threonine, one of the essential amino acid it helps in boosting your immunity by promoting production of antibodies. Black eyes beans have a low Glycemic Index of 44. Is black eyed beans safe for diabetics? As the glycemic index of raw chawli beans is 44, the glycemic load is relatively low .i.e. 4.8 which will manage your blood sugar levels. The high potassium and low sodium content of chawli makes it a hypertension friendly beans. Additional advantage is the cholesterol lowering effect of chawli because of the soluble fiber which is estimated to be around 4.7 in 30 grams of raw black eyes beans. Black eyes beans is safe for Diabetics. Is black eyed beans suitable for weight loss? It is complete package for people trying to lose weight because it has negligible amount of fats, cholesterol free as well as high protein content of around 7.2 which makes it a better option over non vegetarian food items loaded with fats and cholesterol. In fact because of the high protein content, it is the most filling food you can have. The fiber content of around 4.7 also contributes in making you feel fuller. Thus your appetite remains under control. Such qualities in a beans makes it a better nutritious option to shed extra pounds.